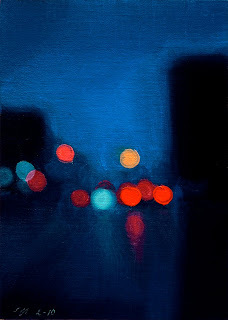 Today's daily painting is the fifty-forth in the Detroit Citylight series of abstract nocturne paintings. 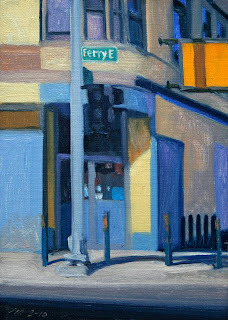 Delray Blues Oil on linen/panel, 2010, 5"x7"
Today's daily painting is down the street from yesterday's corner building. It is on W. Jefferson Ave. 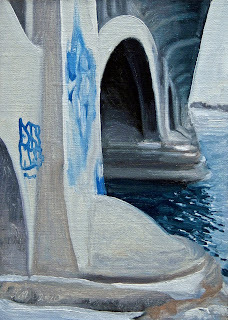 I was interested in all the various shades and values of blue. Can anyone guess what my favorite color to paint is? 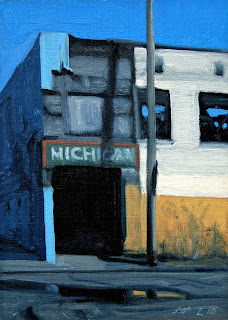 Today's daily painting is a corner building in Delray, one of the worst hit areas of Detroit. MICHIGAN, the image here tells a lot about the state of our economy, but it also leaves much out. 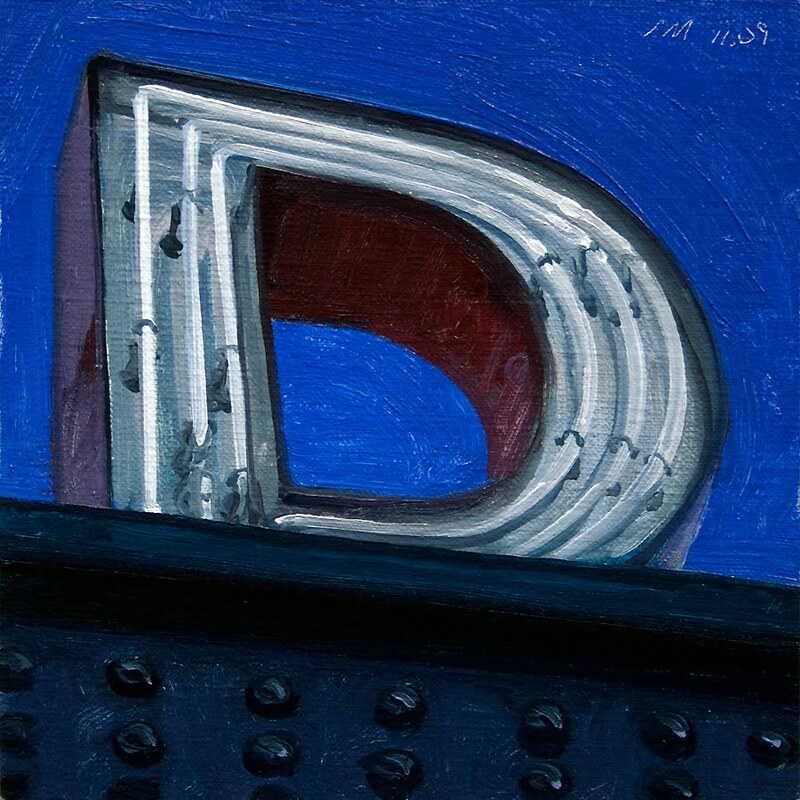 Detroit and Michigan are still viable places to live and create. The young people are really taking the city on with their creativity. There are many opportunities for those willing to take a chance. 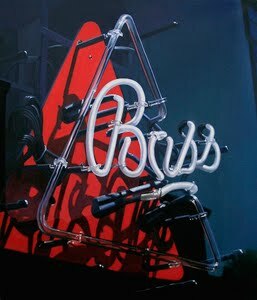 Our local art scene is second to none and is very adaptive, creative and thriving. 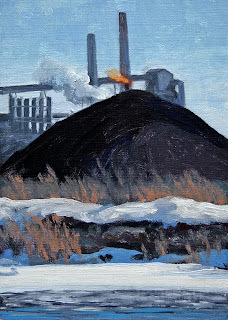 Today's daily painting is a winter landscape of the River Rouge power plant. 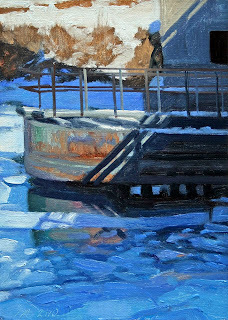 Once again I was drawn to the strong color and contrasts with this winter sunlight. 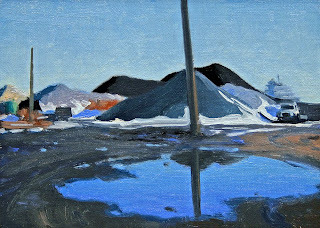 Today's daily painting is a winter landscape of the dock area downriver. The color in this scene really caught my eye. I was happy with the way it turned out. 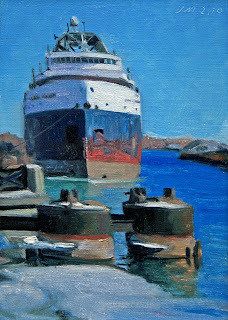 Today's daily painting is a winter landscape of the freighter Sarah Spencer laid-up in the Rouge River. I was surprised to see a set of footprints where I shot this photo. I figured it was another Detroit photographer. When I looked up Sarah Spencer I found this video shot from the same location. Small World out there. This ship has been laid-up more than 2 years at this location. According to Great Lakes Ships, 30 lakers did not sail this last year. 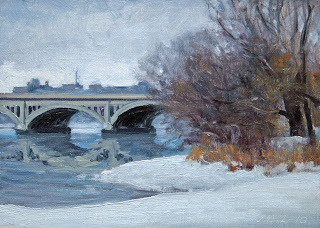 Today's daily painting is a winter landscape of a detail of a bridge on the icy Rouge River. 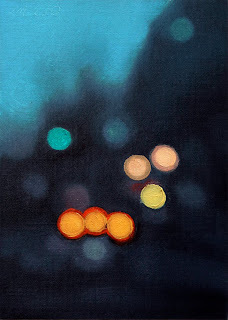 I really liked the abstract shapes and strong warm and cool colors. Zug Island in the Detroit River. 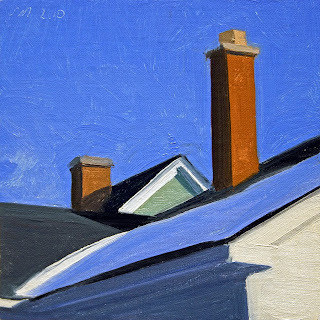 Today's daily painting is the view from my Ferndale studio on a cold winter day with crisp blue skies and cool blue shadows. 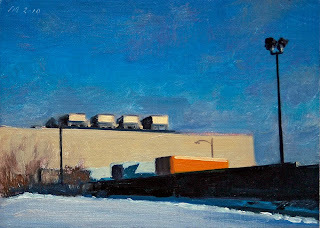 Today's painting is an urban winter landscape of an abandoned building in Brush Park. 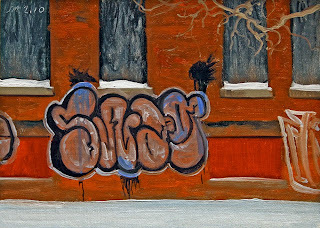 I found the tags and the black paint splotches against the warm red bricks very intriguing. 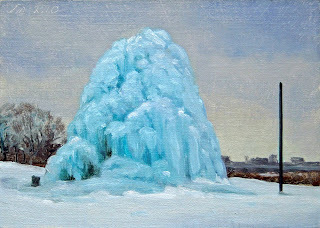 Today's painting is an urban winter landscape of the Ice Tree on Belle Isle. This is made from small pine trees tied together and misted with water. With the cold weather this year it was really spectacular. 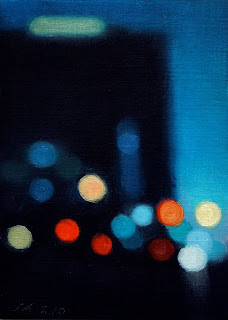 The size and color stands out so strongly from the muted background. This dates back to the mid 196o's. 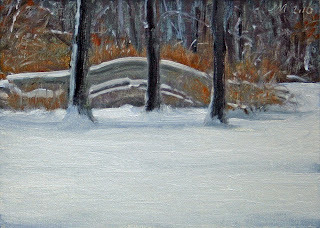 Today's daily painting is a winter landscape of a footbridge over the canoe stream on Belle Isle. As an artist one of the things I love about Detroit is that it is a city of such strong contrasts. 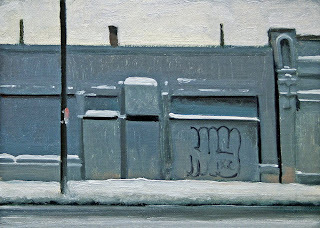 Today's painting is an urban winter landscape of a grey building on East Jefferson Ave in Detroit. I was really attracted to all the subtle values and shades of grey in this building. 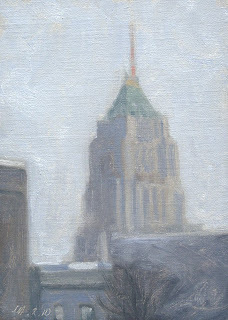 Today's painting is an urban winter landscape of the beautiful Fisher Building in yesterday's snowstorm. 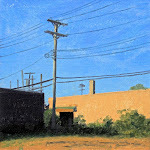 A little more subtle color than yesterday's painting. 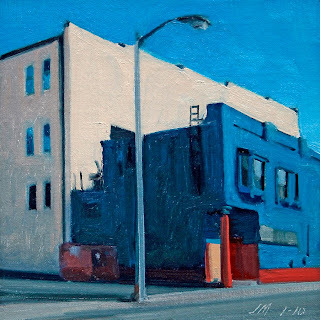 Today's painting is an urban landscape of a building with a Blue wall. I felt the need for some color, so I went back into my photo archives and found this one from last fall. All the primary colors to lift the spirits. 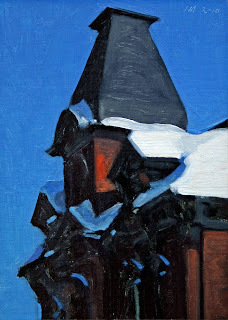 Its snowing outside, will be doing more snow paintings soon. 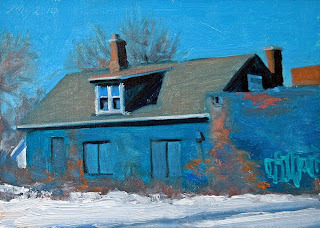 Today's painting is a Brush Park house with deep blue shadows with snow. Even on a cold winter day you can still feel the warmth of the Sun. 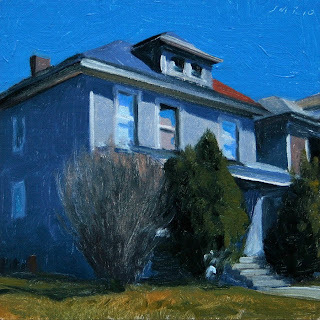 Today's painting is a house with deep blue shadows. 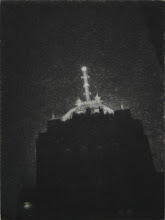 This one seems to have a heroic feel to it. With the sentry trees standing guard. 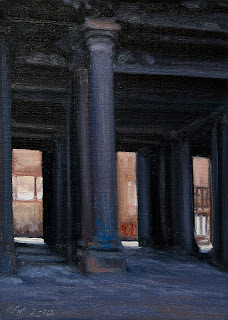 Today's painting is a view of the columns between the main entrance and the waiting area inside the abandoned Michigan Central Train Station on Michigan Ave in Detroit. to see a short video of the inside this amazing building. 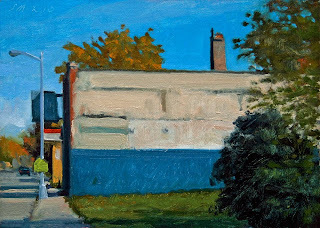 Today's painting is of an abandoned building on Chene St.
Today's painting is a corner building at Chene St. and E. Ferry St I really liked the abstract Mondrian feel to this scene. 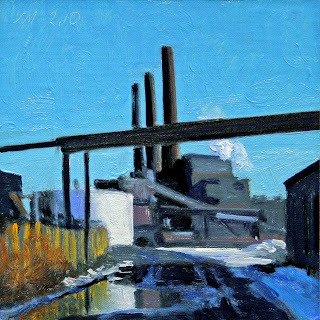 Today's painting is a winter landscape of an industrial scene in Detroit. 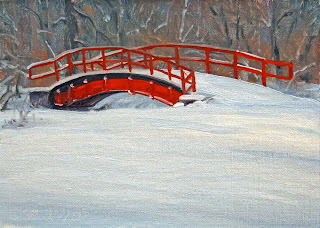 How could I pass up the incredible color in this sunny winter scene. 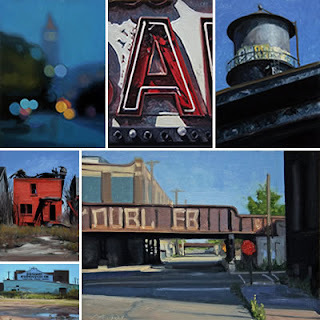 I am very happy to have been reviewed by Raymond Logan on his Daily Painter Review blog today. Please visit Daily Painter Review to see the article.Click on image for larger view. 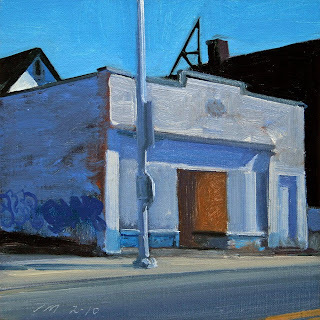 to a collector in New York, NYOil on linen/panel, 2010, 5" x 5"
Today's daily painting is a blue corner building with a bay window and strong primary colors near East Jefferson Ave in Detroit.